With thousands of sites vying for your customer’s attention, how do you stand out in the sea of competition? If you are focused solely on quick conversions, you’re likely missing the boat. With digital “noise” all around, keen marketers and eCommerce professionals are realizing the importance of building relationships to win customer loyalty. In addition to capturing wallet share, it’s important to secure mind share. This mind share is measured by engagement. 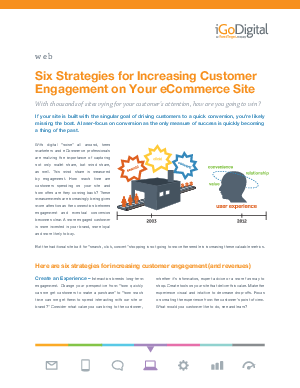 How much time are customers spending on your site and how often are they coming back?